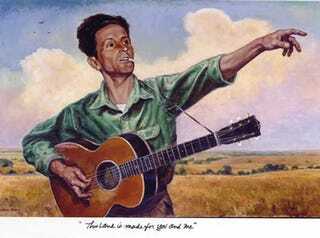 We grew up with this super liberal music teacher who convinced us that Woody Guthrie's "This Land Is Your Land" was a far better national anthem than "The Star Spangled Banner." It made sense to us then because it was told to us by an authority figure and, in retrospect, we still buy the argument. There's nothing particularly wrong with "The Star Spangled Banner" other than no one can ever remember all the lyrics correctly and it requires quite the vocal range. There's an easy, hymnal tune to "This Land Is Your Land" and the lyrics are appropriately patriotic without being schlocky like "God Bless America." The main problem may be the sentiment, which is the somewhat socialistic-if-you-think-everything-is-socialistic belief that America is for everyone. Try building a wall around that thought. Of course, there are so many reasons to be patriotic, as Dearthair pointed out in our post on the unattractive 2010 Acura RDX. We really must thank the Japanese, and particularly Acura. If you have a look at all the offerings from Acura, Toyota and Lexus, it's pretty hard to look at vehicles like the Malibu, CTS, G8, or pretty much the entire Lincoln lineup and think any of them are ugly. Put the MDX side-by-side with the Buick Enclave, and tell me you wouldn't immediately choose the Buick? And if you wouldn't immediately choose the Buick, you're a moron, and should be smacked in the head until you get smarter. The Buick is better looking with one of the best interiors I've seen in a near-luxury car. What with BMW repeatedly falling on their own sword and making each successive car less attractive than the previous one, Mercedes abandoning class in favour of garishly bold overstatements, Toyota producing the Venza, and Acura refusing to show us mercy by violently exploding before we can see their horrible cars, it's the perfect time for the American manufacturers to make some beautiful, quality cars, and remind the world why they used to love them. We can't wait for an America that succeeds even when everyone else is doing well, not just because they aren't.